This text WILL NOT display on the front page. Only items in the content wells below will display. It's something about the custom theme. If this text DOES display on the front page, please contact webmaster@pharmacy.purdue.edu! 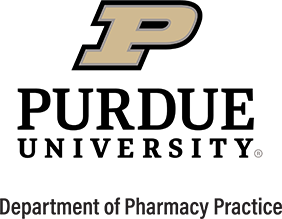 Dr. Amy Sheehan was recently invited to participate in the Purdue University Insights Forum for the 2019-2020 academic year. Dr. Brian Shepler and his group of students win 3rd place at the annual IPhO VIP Case Competition. Dr. Amy Sheehan was recently selected as a Fellow of the Purdue University Teaching Academy. Dr. Kristin Villa was recently selected as an Associate Fellow of the Purdue University Teaching Academy. Dr. Karen Hudmon and her team, including Dr. Alan Zillich, were selected to receive the Weiderholt Prize for Best Published Paper for Economic, Social, and Administrative Sciences.